The glimpses of wild animals roaming in their natural habitat are full of fun, thrill and excitement that I experienced during my Ranthambore Tour last weekend. My closed friend Nitin invited me for the Ranthambore Wildlife Safari and without giving a second thought, I warmly accepted it. I and Nitin reached Ranthambore on Friday night through our own car. The car trip to Ranthambore from Delhi is itself a story because of the charm and thrill that we have experienced throughout the way. Ranthambore National Park is among the most famous national parks of India located in the Sawai Madhopur district of Rajasthan. The park is situated between the Vindhya and Aravali hills and is bounded by the Banas River from the north and by the Chambal River from the south. There are many lakes in the park which supports a large number of flora, fauna and amphibians species. 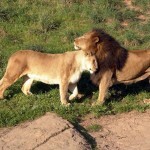 This sanctuary is one of the most visited attractions of Rajasthan Wildlife Tour. When we reached this place in the night we stayed in nearby resort. Through the balcony of my room, I saw the wide expanse of this wildlife reserve, which reminded me the scene of a movie. The bright moon and twinkling stars created a dramatic atmosphere which robbed our heart. Though we were eagerly waiting for dawn but our unending gossip gave only few hours to sleep. Next morning we wake up early and prepared ourselves for safari with our camera. We began our safari at 7 am through a jeep with 4 other visitors. Our guide Sohan Singh used to brief us every moment about the varied flora and fauna of this park. The excerpt of his introductory note was that the national park was hunting ground of the Maharajas of Jaipur, which became one of the Project Tiger reserves in 1973 and a national park in 1980. According to government data this national is the home of 40 types of mammals, 320 species of birds both resident and migratory, 40 classes of reptiles, 02 amphibian species, 50 species of butterflies and 300 varieties of plants. Few minutes after our safari began a group of 5 Rusty Spotted cats swiftly crossed our way. We were looking here and there to see other animals. This keen searching was broken by two leopards behind the bush. We stayed here for a while and took several snaps of playing leopards. When we proceed further we saw other animals of this sanctuary like wild boar, sambhar, chinkara (Indian gazelle), spotted deer (Chital) and wild buffalo. 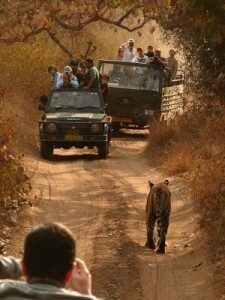 But we were dying to see royal Bengal tigers the pride of this wildlife reserve. We requested Sohan to take away to that place we there are good chances to see the king of a jungle. 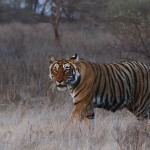 On our kind request Sohan took us 2 to 3 km northward of this national park where the chances of spotting tiger are high. But he didn’t guarantee it. He told us that it is on your luck. Our jeep driver was moving slowly so that we have a chance to see tigers. Suddenly, one of our co-passengers screamed out after seeing the Royal Bengal Tiger behind the bushes. Our guide told us to remain silent and keep watching because any movement would be a provocative signal for nearby tiger, which could result anything. After 15-20 minutes the king of a jungle vanishes into the bush, and our driver headed us towards the exit point because it is 10: 30 am, which means the end of morning safari. With several memories in our heart and in our camera we returned to our resort. 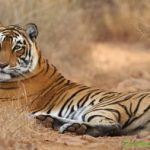 This safari will remain one of the memorable safaris for me because for the first I closely saw the Royal Bengal tiger and other animal species. Close Encounter With the Majestic Predator!